When I was a kid, I never thought too much about food. All I knew was that you didn’t miss dinner at my house. My cue to run home for dinner was the five O’clock whistle that blew from atop a 300 ft smokestack in my hometown. We always had dinner together although I was frequently the last one to be seated after washing up. The food was always good but my interest in its preparation came later in life. Often, our favorite comfort foods were those dishes that mom made. I wish now that I had paid more attention so I could re-create them today. I often wonder, how did she do that? For some reason, a memory of her Salisbury Steak popped into my head the other night. It was so good and her gravy was amazing. I had to give it a try. It didn’t turn out like Mom’s, but it was pretty darn good anyhow. Maybe someday I’ll nail it. In the meantime, this will do just fine. It only took me about 30 minutes and it was a hit with the kids. Serve this with mashed potatoes and some crusty bread for mopping up the delicious gravy. Here is what I did. In a large bowl, combine ground beef, bread crumbs, 1/2 of the tomato paste, ground mustard, Worcestershire, onion powder, salt & pepper. Mix gently with your hands and form into equal patties about an inch thick. Drizzle some oil into a cast iron skillet or heavy bottomed pan. When it’s screaming hot place the patties inside and cook for 2 to 3 minutes and flip. Sear for another 2 or 3 minutes and remove patties to a plate. Pour off any extra accumulated fat. Reduce heat and add onions and mushrooms to the skillet. Sauté. They’ll develop great color & texture. When cooked to your liking, add the chopped garlic and cook for one minute while stirring to get all the flavorful bits from the bottom of the pan. (NOTE: if using flour, add it here and stir to make a roux. You may need to add a little butter to cook out the raw flour) If using cornstarch, whisk it into the beef brother to avoid lumps and add it now, a little at a time. Add the remaining tomato paste to the gravy. When mixture comes to a boil, it will thicken. 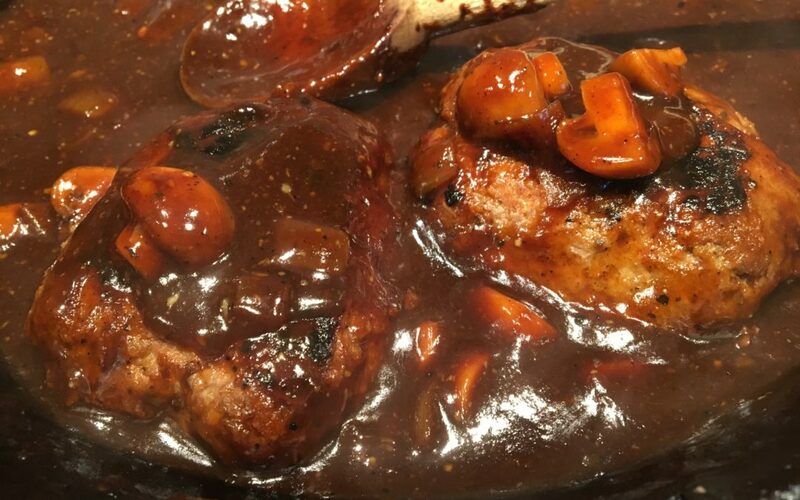 Slide the patties into the gravy and simmer for 3 or 4 minutes to finish. Add a pat of butter for a nice silky sheen. Sprinkle with parsley or chives and serve.